I am Jaxon Taylor. Right now, I can’t talk. You may wonder why I can’t use words yet. It’s because I process the world differently than most people. The doctors call it autism. Mommy and Daddy say I’m unique. In this letter, Mommy and Daddy will be my voice. Trust and communication are the foundation of every successful relationship. You’re reading this because we want our relationship to be successful. Maybe we can teach each other something along the way. Your brain filters thousands of sensory inputs at the same time: sight, sound, smell, taste, and touch. Mine does not. Imagine trying to have a conversation without the ability to censor the sounds around you—the birds, the cars and distant honks, the smell of the nearby flowers, the fast food restaurant across the street, and the exhaust of the car that just went by. Even the feel of the wind on my face all process at once. It’s a “traffic jam” of senses. Without the ability to express myself, unless you know what to look out for, my needs can be unmet. Although I’m usually pretty calm, this can be frustrating. Hand-over-hand prompting, pictures, or signing are all great tools to help me communicate. Social cues are important communication skills. Eighty percent of human communication is through nonverbal behavior. These queues may not be something I pick up on well. This will require that you make efforts to include me in group activities. Imagine being viewed as a problem to be fixed. How would that shape your self-image? All people want to be accepted and appreciated. Everyone has a purpose in life. We all have a set of natural strengths. Moving forward with a goal, positive energy, and hard work will help me find my gifts. Love and guidance are integral in my journey. You may have heard that autism has a spectrum. Maybe you’ve even looked up symptoms of autism. But have you ever asked why the symptoms are the way they are? Understanding why will help you understand me and help with what we can do together. Autism or not, each person is different. The spectrum of autism represents many variations of similar symptoms. Take the five senses, for example: sight, smell, touch, hearing and taste. To filter out these sensations at will is a great challenge. There are two distinct categories of sensory challenges: hypersensitive and hyposensitive. Hypersensitive means the senses have a heightened sensation. Colors may seem more vibrant, clothes may feel irritating, smells and sounds can even feel overwhelming. Hyposensitivity occurs when the senses need stimulation. I may jump, spin, make loud sounds, or bang my hands on surfaces. All of my symptoms seem to indicate a hyposensitivity. Sight: I often move my hands or toys over my eyes. Likely it’s because I focus on the outlines of objects. When you enter the room I may not notice right away. Picking you out of a crowd may be hard too. Bright lights and moving objects, like flashlights, or ceiling fans, can be mesmerizing. A lot of light helps me to focus. Light and visual movement actually stimulate my nervous system. Sound: You might see me banging on objects or walls. Although I may not acknowledge certain sounds, I do love loud music and the vacuum cleaner. Although I’m shy, crowded noisy places don’t bother me at all. Touch: My threshold to pain is very high. Heavy objects, tight, or snug pressures make me feel really good. Imagine a diminished sense of touch. It’s likely I have a hard time feeling light touches. At times, I might come across as being rougher than others, but a firm touch is more comforting to me. By touching, I study everything I explore. Taste: Food textures are a big deal. Mushy foods like yogurt, pudding, or mashed potatoes are not appealing at all. Crunchy foods like dry cereal, pretzel sticks, rice cakes, or crackers are some of my favorites. I’m always exploring new things to observe, smell, and taste with my mouth. Balance: Swinging, spinning, and jumping are some of my favorite things to do. I can do them longer than most people can without getting as dizzy or making me sick. My nervous system craves this kind of stimulation. The variances between senses can be wide ranging. Person-to-person, there are endless combinations and layers of severity. This is a key aspect of why there is a spectrum. Imagine my world. I’m four years old trying to learn language for the first time. Layer in sensory bombardment and the constant impatience of “normal” people. Standing up for myself is not something I can do right now. Help me help myself. Be my voice when I cannot. Love me when others will not. Care for me by showing me your patience. There is great power in believing in someone regardless of the feat. Unconditional love is blind faith. It’s hard work. It’s also persistence. If you’re reading this, I’m asking you to believe in me. Johanna and Chadwin Taylor are autism awareness advocates. Jaxon, their youngest son, is on the autism spectrum. Johanna is a stay-at-home mother who stays in constant communication with Jaxon’s therapists at the ABLE Academy in Southwest Florida. She takes an active hands-on approach to Jaxon’s development every day. 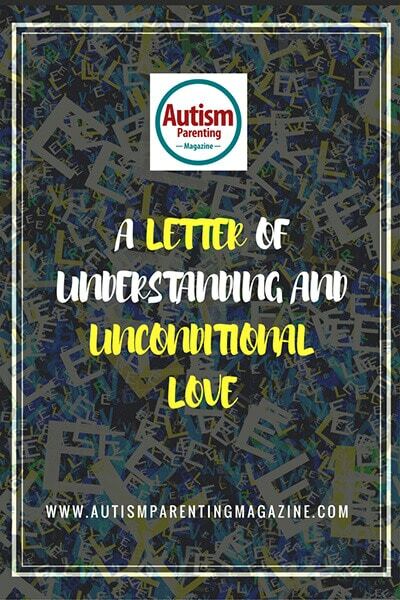 Chadwin has a passion for writing and is committed to raising autism awareness and education.